Time is money. This is a universal statement that applies to organizations of all sizes, across the world. That’s why companies are constantly finding ways to perform tasks at a faster rate, without compromising on quality. Needless to say, the world of e-learning is also affected by constraints of time. E-learning development is a time consuming process. But, the need for e-learning courses is swift. As new products and services keep getting released in lesser time, the requirement to train your employees becomes acute. In order to keep up with this, organizations or e-learning vendors use rapid authoring tools. These tools enable you to create e-learning courses quickly and effectively, without using complicated programming techniques. 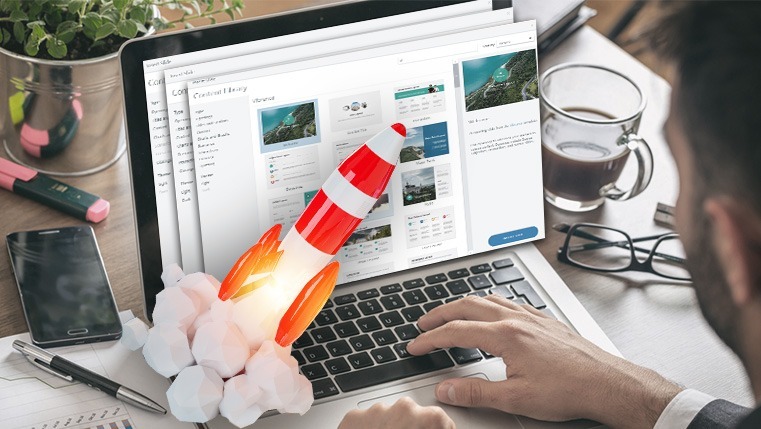 Even after using authoring tools, e-learning development takes a lot of time as you need to develop a lot of engaging interactive and multimedia elements. E-learning developers usually get raw data consisting of long procedures, descriptions, and presentations. By using e-learning templates, developers don’t need to start creating the course from scratch. So basically, you already know how your course is going to look like right from the first slide. All you need to do is chunk content and fit it in appropriately in the template blocks. You can, not only include interactions in your course with minimum efforts, but also embed audio, video or any other multimedia quite easily. With templates, you don’t need to spend a lot of time and effort to develop assessments, icons, images, backgrounds, etc. as everything is inbuilt. If you are using authoring tools like Articulate 360, you also get a vast library of templates to choose from. This maximizes your return on investment as you can achieve greater and better results with the same amount of resources. Don’t think that if everyone is using a template, your courses will end up looking similar. While templates do provide a standard framework, they also give plenty of options to customize the course. You can tweak almost every aspect of the course, such as colors, fonts, screen layouts, design, etc. to better suit your requirements. This allows you to make a course that looks and feels like the intellectual property of your organization, rather than something that just been put together haphazardly. Templates can be customized according to your client’s branding so that digital learning program feels like the property of the organization. When you use templates for e-learning development, you let technology do all the heavy technical work. You don’t have to worry about integrating games, programming gamification elements, or course compatibility across various devices. As you don’t have to bother about these nitty-gritty aspects of the digital program, you can focus on the things that matter the most: your actual learning content. You can use this extra time to breakdown complex topics into easily digestible information nuggets or figuring out some out of the box strategies to convey a knotty subject. Developing a digital learning program is usually for the long term. But in the long term, newer courses that are developed may not be visually consistent with your old ones. Templates can completely overcome this problem. If you are using customized templates for your development, you can save them in a common repository for future reference and use. There is also no need for you to worry about any sort of incompatibility with devices or software applications, as templates have passed through many tests before they are released. Using e-learning templates greatly improves your development productivity. It not only allows you to keep a tight development schedule, but also ensures consistent course quality.